The sun bear is the smallest and rarest of the world's eight living bear species. Sun bears are excellent climbers and spend considerable time in trees where they feed on sweet fruits, small rodents, birds, termites and other insects, and honey. The sun bear was formerly widespread in the lowland forests of South-East Asia but has disappeared from most of its former range in recent decades. In Cambodia, sun bears are still found in few protected areas in Ratanakiri and Mondulkiri provinces. 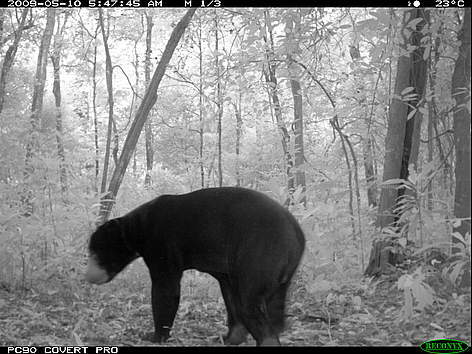 Within the Eastern Plains Landscape, WWF camera traps have documented the sun bear’s presence in Phnom Prich Wildlife Sanctuary and Mondulkiri Protected Forest. Like other bears in Asia, sun bears are highly threatened because of their continued use in traditional medicine.